Blissfield bed and breakfast travel guide for romantic, historic and adventure b&b's. 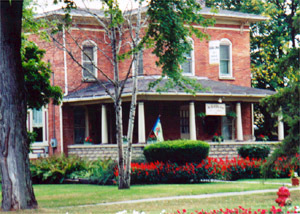 Browse through the iLoveInns.com database of Blissfield, Michigan bed and breakfasts and country inns to find detailed listings that include room rates, special deals and area activities. You can click on the 'check rates and availability' button to contact the innkeeper. If you have plans of settling in a place or just looking for a quiet, relaxing weekend that is the combination of quaint and a touch of modernism, Blissfield would be the perfect place to be. Awesome riverside parks, some of the best fine dining, or just whiling away the time, you will find this rustic town the ideal place to spend the weekend. Try a Blissfield bed and breakfast while in town and enjoy the history and culture. By Historic H.D. Ellis Inn & Spa Bed & Breakfast.